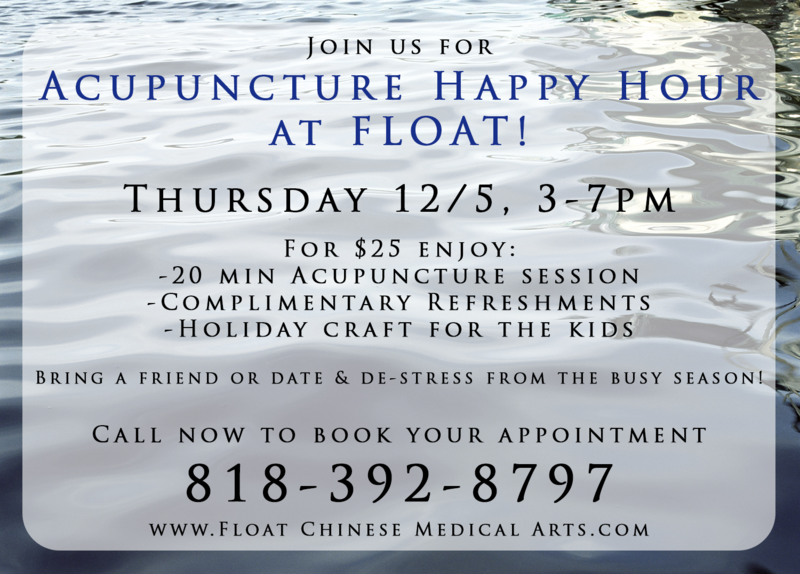 FYI – Acupuncture Happy Hour is a kid-friendly event, but the treatment rooms will be adult-only to preserve a quiet, therapeutic environment in which you can relax. The holiday craft will be supervised by a fabulous artist/kid-wrangler, and is appropriate for kids ages 18 months and above. Babies and younger children are welcome, as long as they are accompanied by an adult at all times. This event will sell out, so call now so you can get the time slot you want: 818-392-8797. We hope to see you there! Did you just stumble on this blog post? Find out more about FLOAT: Chinese Medical Arts here. We look forward to meeting you soon! Post by Abigail Morgan, L.Ac.. Owner of FLOAT: Chinese Medical Arts; water image by Dave Clark Photography, all rights reserved. Now through December 24, 2013 – take advantage of a rare discount on the initial visit for new patients! As you’ve surely noticed, the holiday season insanity starts with Halloween (yesterday! ), and along with it, stress, common colds and the lack of self-care time. Prove ’em wrong and thrive through it! If you have a friend or family member considering acupuncture, please share this post with him or her. Posted by Abigail Morgan, L.Ac, Owner of FLOAT: Chinese Medical Arts. And please note that the office will be CLOSED the week of July 18-22. If you would like to schedule an appointment please call our office at 818-392-8797. The office is closed on Mondays and Thursdays, but we do check and return voice messages on those days. 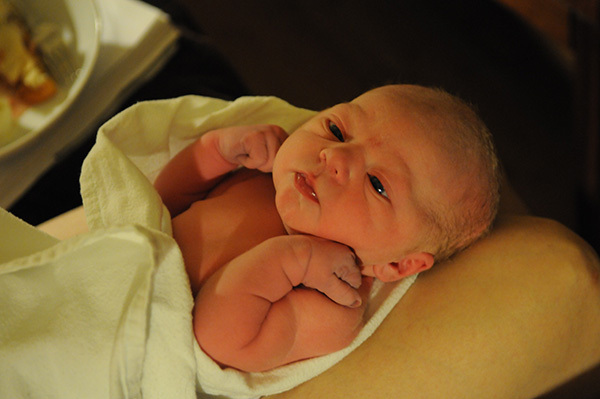 I WILL BE AWAY FROM THE OFFICE ON MATERNITY LEAVE from July 26-September 20, 2010. I plan to return to the office on Tuesday, September 21. During my leave, my colleague Laura Erlich, L.Ac, MTOM, will be seeing patients in my office on Thursdays only, by appointment. Laura has been a trusted colleague of mine for over 9 years, and has a thriving acupuncture practice of her own (M, W, F) on the West Side (www.laherbsandacupuncture.com). Laura is one of the only other L.Ac’s in Los Angeles who specializes in TCM Obstetrics & the Childbearing Cycle as well as Orthopedics, and she has also been a birth doula for 12 years. We went to the same Chinese Medical school in LA, and (ironically) the same massage school in New York City, many moons ago (though not at the same time). We also share a very similar approach and needling style. If you would like to be treated by Laura in my office (on Thursdays only) during my leave, please call her office directly at 310-598-5209. If Thursdays are not convenient for you and you’d prefer to be treated on a M, W, F, Laura would be happy to treat you in her own office in West Los Angeles. Laura and I have the same insurance biller, so if you’ve been using your health insurance plan to cover your acupuncture treatments with me, nothing will change. Similarly, if you usually pay cash or use a health savings plan card, Laura will honor the same rates as you pay me. The only difference will be that you’ll be paying your co-insurance or office visit fees directly to her instead of to me. She will also have access to your chart, and will be able to refill or change any herbal prescriptions, supplements or topicals you have been getting through me. If you lose this email, all of this information will be available soon on the blog section of my website, and Laura’s contact number will also be on my outgoing voicemail. If you have been referred to me as a new patient and were hoping to set up an appointment during the dates I’ll be gone, you may either call Laura Erlich, L.Ac., at 310-598-5209 and set up an appointment with her in my office or hers, or you can call my office at 818-392-8797 and leave a detailed message requesting an appointment with me on or after September 12, 2010; my assistant Jacqueline will return your call within 48 hours and get you on the schedule. My office assistant will be checking messages and mail during my leave; if you would like to schedule an appointment on or after my return on September 12, please leave a detailed voice message at 818-392-8797 and Jacqueline will get back to you within a couple of days. Please remember that as always, we handle all scheduling requests and changes by phone, NOT email. Jacqueline will also be available periodically to refill herbs/supplements/topicals for existing patients; we can do one refill without a re-exam. If you’d like to pick up a refill between July 26 and September 10, you may leave a voice message (please no email requests for refills) at the office line (again, 818-392-8797) and schedule a time to pick it up with Jacqueline. Please note that we cannot sell herbs or supplements to anyone who is not a current patient. Many of you know Sara Pereira, LMT, Licensed Massage Therapist and Certified Placenta Encapsulation Specialist (www.mommyfeelgood.com). Sara will continue offering full-body therapeutic massage for men and women in my office, by appointment, while I’m gone. To schedule a massage with Sara (either in our office or in your home), please contact Sara directly at 213-924-3239 or through her website. Thank you so much, and I look forward to seeing you when I return to work in September!